Bitcoin, a Florida judge says, is not real money. Ironically, that could provide a boost to use of the crypto-currency which has remained in the shadows of the financial system. if its not money it must be goods: and therefore liable to purchase and sales taxes. This ruling is ridiculous. Its clearly used to fund transactions. "Michel Espinoza, who had faced money laundering and other criminal charges for attempting to sell $1,500 worth of bitcoins to an undercover agent who told the defendant he was going to use the virtual money to buy stolen credit card numbers." Guy1 tells Guy2 that he wants to purchase X from him to use X for buying illegal objects Y.
X itself isn't illegal, but may or may not be a currency. What did the police think in the first place? Even if bitcoin were a currency, it is the equal of a guy who may or may not be a drug dealer exchanging his may or may not be drug-earned-money for another currency. Am I breaking the law for making such exchange with that shady person? A currency must have something backing it. You can make up a cryptographic chit of some sort, but it still doesn't have anything backing it. And that is why BitCoin exchange rates are so unstable. What BitCoin needs is something physical to back it. Economies of the world used to use gold and silver. But as the commodity price of gold and silver changed, things got silly. So today, we are decoupled from those commodities and now we use the creditworthiness and economic base of entire countries. Nobody has named what stands behind a bitcoin.So it is not a currency --YET. There is nothing preventing BitCoins from being adopted as a currency in the future. If it walks like a duck... legal nuance can redefine it as a goose. Funny... You'd think that there'd be a statute that would cover the transfer of any goods with monetary value for illegal goods. Gold has a legacy status as currency. But it's eventually a shiny yellow metal with few practical value-creating uses - it's just decorative really. So little percentage of gold is normally traded on any given day that any one who can bring a sufficient quantity to trade (like the Chinese who now mine the stuff for 60% of the bullion rate) can set the value of all the gold reserves in the world on that day:- Particularly as other sellers back away if the price drops hard. Gold's recent instability shows it is not much better than bitcoin. Bitcoin has intrinsic scarcity. The software limits the amount of new bitcoin that can be mined and this gets less as the years go by. It cannot be forged. These two thing alone make it an effective currency. It needs no conversion into other forms of wealth. Its value rest on the trust people place on the software. As this trust grows it can only appreciate in value. Going, you missed the point: the value of a commodity does not arrive from scarcity alone. Many things are scarce. A slice of toast that looks like the face of Elvis is scarce too. That doesn't make it valuable. The thing that makes a currency valuable are the assets that back it. It may be a commodity all by itself, such as platinum or oil. But a growing economy is an even bigger asset. ab3a, I don't think he missed the point at all. Anything can be used as a currency. What matters is that people agree to use it as such and give it a set value. All kinds of things have been used as currency over the years and quite often there was nothing valuable backing it other than peoples agreement to use it. A currency must have something backing it. "Common type of currency issued by official order, and whose value is based on the issuing authority's guarantee to pay the stated (face) amount on demand, and not on any intrinsic worth or extrinsic backing. All national currencies in circulation, issued and managed by the respective central banks, are fiat currencies." The tiny island nation of Yap, in the West Pacific, has used chiseled stone disks as money for centuries. The size of the stone determines their value; some of the stones are so large that a pair of men carry them with a beam through the middle of the stone. Fiat currently is backed up by a legal debt obligation. The original issuer of the money has to obtain the money back in trade to fill the debt eventually, and that means it holds value because someone needs it. Of course the government can default on the bonds they issue and fail to pay them, at which point the money thus issued becomes worthless. That's unlike the chiseled stone disks whose value depends on their value as status symbols for the purpose of a particular culture - they're more like jewelry or paintings than money - or glass beads to indians. Someone outside of Yap wouldn't consider them to be money, or to hold any value. A slice of toast that looks like the face of Elvis is scarce too. That doesn't make it valuable.. Er...I'd venture that such a slice of toast would be pretty valuable, provided the owner's shrewd enough, willing to put in an amount of effort and time, and has some connection/connectivity (which really are the requirements for any kind of investment)....but maybe that tie in with the backing assets you mention. I mean, s/he might make a video of that toast, describing how and where it came into his/her possession, and post this on the internet. Value doesn't have to equal numbers in a bank account; the numbers of views, likes and subscriptions can serve a similar purpose, being sufficient in themselves, bringing about those 15 min of fame, or a good feeling (isn't this the purpose of wealth? ), or as catalysts for ad revenues. The poster may even maintain momentum and make similar vids, becoming a net celeb! Alternatively, the toast my be auctioned on eBay. One thing not scarce is Elvis' fans: someone may be crazy enough to go to any length to obtain it! This's assuming that slice of toast is a freak of nature (or bakery!). I don't know if there's "bread sculpting", but if it's man-made, then this's another matter entirely: meaning it's an objet d'art, with value in the traditional sense nearly assured (scarcity is the hallmark of most art). While "shelf life" is an important criteria for any currency - hence the advantage of gold and silver, beside scarcity - such a toast may be ziplocked straight away in the freezer, and a thermal box brought in for its transport. This being PhysX, I'm sure other tech exists that allows, post-process, for keeping bread unspoilt for considerable lengths (all rests on the state of toast to begin with and, again, on the effort & time the owner is willing to take). Nobody has named what stands behind a bitcoin. 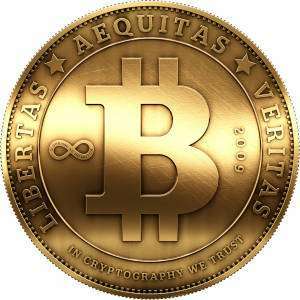 Bitcoin is a digital currency based on a cryptography algorithm. It's backed by encryption and has a limited supplied based on the algorithm that creates it. The point of bitcoin is that's it's completely digital so having it backed by physical objects would be counterproductive.